This product has been discontinued, but we replaced it with a better one! Check out the Cosmic ECHO Squared here. Brand NEW Space Delay Pedal from Synthrotek. This pedal is packed with HUGE features. There are 3 foot switches allowing maximum flexibility. The first switch turns on the delay feature with an “amount” pot and a “mix” pot, when this is switched off it goes to true bypass. The middle switch engages the feedback which can be adjusted by amount by the pot just over the on/off LED. The third switch engages the LFO feature which adds an LFO to the delay (VERY COOL AND SPACE LIKE). The LFO rate can be tuned by a pot as well as the color of the LFO (high to low frequency). This pedal is large and built into a Hammond 1590 DD aluminum case. Graphics are heavy duty and can take years of use. A very unique pedal. Made in the USA by US labor. More info at www.synthrotek.com Check out our YouTube demos. Is there any chance of you guys releasing the Echo Quest as a kit in the future? Yes! Right now, it takes 3 separate boards to build but we already have it designed with some better options. Hopefully in a couple months, thanks for asking! Awesome! Can’t wait. Count me in for a kit when it’s out. Is the LFO synth being added/mixed into the output of the delay? Or is the LFO modulating the output somehow? Hi Dan, the LFO is modulating (pin 6? I think, I have to get back into it, we are making a whole new PCB and project for this soon) the PT2399, so the actual delay itself is being affected. That’s odd, I’ve checked through nearly all of our pages and I can’t find the error you mention. It would be much appreciated if you could direct us to one of the broken pages. Either way, thank you for taking the time to let us know of the errors! Can this (or something close enough) be done with the pt2399 dev board with the true feedback mod and a 555 timer on pin 6? I’m also curious as to exactly how the 555 gets attached to pin 6 (does the 555 circuit replace the pot already on pin 6, or is it inserted between them, etc.). Also, how are you modulating the color of the 555? So I’ve been searching around for one of these for a long time, and no luck. Are you going to produce these again, in any form? Or at least know where I can get my hands on one? 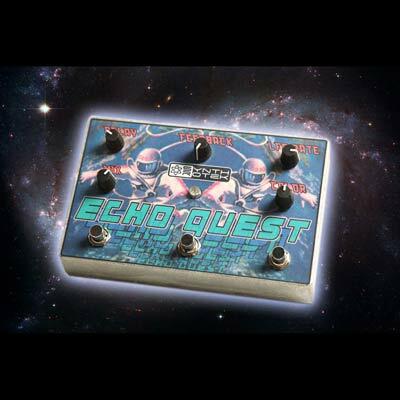 Sadly the Echo Quest is out of production for the time being. It may return one day in a slightly different design. Thanks for the interest, though! Hey Jake. Sadly the product has been out of production for so long that no one really remembers much about the circuit. The guy who designed it for us hasn’t done any work for us in a long time and we don’t have a way of contacting him anymore. We are hoping to eventually start developing a newer version sometime down the line, but we don’t have any idea when that’s going to be. Bring this pedal, or something similar, back!!!!! !